Last week the American Association of Pediatrics (AAP) released new guidelines on screen time for kids. Their recommendations included tips on how to limit screen time and monitor children’s exposure to media, but they also stressed how much more research we need on how digital media effects children’s brain development. “Among the many digital media topics that will benefit from additional research include the impact of multitasking, data privacy, demographic targeting, operationalizing digital literacy, digital media use’s impact on short- and long-term memory, and what learning looks like with a digital interface,” they state in their overview of the symposium. Phew! Basically, psychologists have a lot of work to do before we understand how young brains respond to digital media immersion. Right now, we rely on anecdotal evidence from our own lives to navigate how much of our lives to spend on our tablets, mobile and desktop screens. Last year, WNYC’s podcast series “Note To Self” produced a segment that attempted to tackle some of the same issues that the AAP addressed when it comes to how digital media may be effecting our lives, especially when it comes to reading online. 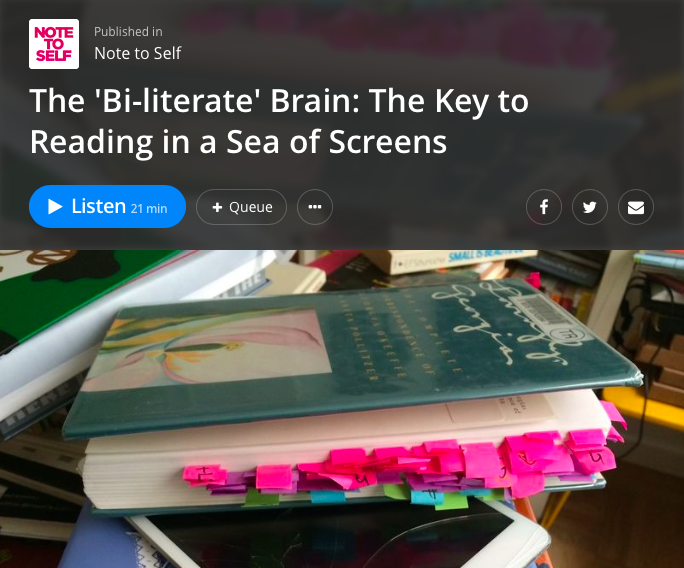 They focused on the topic of reading on screens versus in print, and talked to cognitive neuroscientist Dr. Maryanne Wolf about how the human brain is adapting to reading online. She said that our brains have started adapting to the skimming and scanning that occurs when we read online, and as a result, humans are losing their ability to read deeply and concentrate on one story. “We need to understand the value of what we may be losing when we skim text so rapidly that we skip the precious milliseconds of deep reading processes. For it is within these moments—and these processes in our brains—that we might reach our own important insights and breakthroughs,” she wrote in a Nieman Reports article. But show didn’t neglect the benefits of being able to scan, skim, and connect information while reading online. Host Mannish Zomorodi visited writer Maria Popova, who prefers reading online to write her blog, “Brain Pickings.” She suggested that maybe there’s a little too much hype surrounding the concern of screen versus print reading. The way we read has always changed with the times. And, indeed, digital literacy is something that new curriculums and educators find very important for their students’ future sucess. The ability to multitask and connect information between a variety of online sources are vital skills in the modern job market. In the end, the show sums up the ideal reader as one that has a “bi-literate brain,” one that’s able to switch between deep, linear reading and the more scattered style of online reading, and still reap the benefits of both worlds. Although the AAP guidelines don’t give precise guidelines for how much time kids should spend online versus on paper or interacting with their peers, classrooms around the country are starting to figure their own ideal ratio. Education Next took a poll that showed that many teachers believe 30% of class time online is ideal. With future funding for research on child development and screen time, hopefully educators will eventually have more concrete guidelines for how to split the amount of time students spend online, reading on paper, and interacting with their peers and teachers.